The Nature of Healing by Martin Goldstein, DVM, is a necessary addition to the library of the pet owner who enjoys and appreciates the use of holistic health care for his beloved animals. Goldstein runs a renowned clinic in South Salem, New York and is a graduate of Cornell University. He shares his philosophy of how animals should be treated but also shows exactly what to do to begin treating our pets. The book talks about what types of food we should be feeding our pets. He makes an interesting observation about exactly what is in a 13.2-ounce can of dog food. He chooses a popular brand of dog food and goes through ingredient by ingredient exactly what is there. It is quite horrifying. There is a chapter on the “Dubious Legacy of Vaccines.” He noticed years before the “Colorado State Protocol” that our beloved pets were being over vaccinated and many of the maladies that they suffered from including cancer were being caused because of over vaccination. He chooses to titer his animals and in a case of any reported incidence of a certain disease will consider giving a weight-related dose of vaccine in the event the animal’s immunity is low. Here is an interesting fact: the dose of vaccine administered a Chihuahua is the same dose that is given to a Great Dane. Doesn’t make much sense does it? He lists all the tools of his trade including the use of homeopathics, acupuncture, vitamins, supplements etc., that he will use to treat specific illnesses. He spends much time talking about what he calls a “healing crisis,” in other words, an animal who is treated holistically may actually get worse before it gets better. His chapter on an “Alphabet of Ailments” goes into his treatments for a range of illnesses from allergies to worms. He talks about spirituality and our pets in the chapter “The Spiritual Realm.” In the chapter, “The Death of A Pet,” he talks about euthanasia He calls himself an outsider in the decision that has to be made. The relationship between an owner and pet is an intense emotional relationship that has lasted the pet’s lifetime and a decade or more of the owners. The communication about ending that relationship is between them. The respect this man shows for his patients and their owners is phenomenal. The Source Guide listed in the back of the book is enough of a reason to purchase it. In it, he lists the manufacturers whose products he uses in his own practice. It also lists a compendium of holistic books, newsletter, web sites, veterinarians, and associations. Add this volume to your library, you will not regret it. 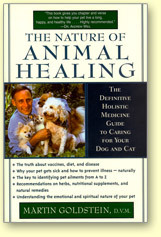 The Nature of Animal Healing, Martin Goldstein, DVM is published by Alfred A. Knopf, Inc. Borzoi Books which is a division of Random House, Inc. 1999.